The male is larger than the female and a nuchal hump is evident on the males. The males are a little more colourful. The females have more yellow hues on their fins. This fish can be aggressive and shouldn't be kept with smaller fish. Keep in either a species tank or with other similar sized South American Cichlids and larger peaceful South American Characins. Omnivorous, will take most foods including Cichlid pellets, bloodworm, daphnia, blanched vegetables and algae wafers. Prefers a good current and likes a small pebble or gravel substrate. Can do well in a planted tank provided plants are well established as this fish can dig. 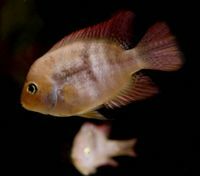 A semi-aggressive Cichlid. Aggression increases, especially on the part of the female, if they are spawning and she will defend her eggs and fry ferociously. An attractive Cichlid once it has settled into its environment. It's body and fins have blue, yellow and red hues on a olive green base colour. It gets its "T-Bar" common name from the 'T' shape that can occasionally be seen on its flanks.